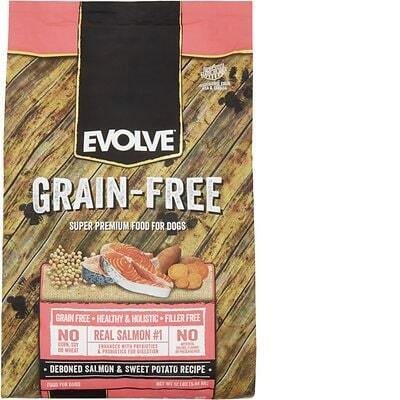 Evolve Deboned Salmon & Sweet Potato Recipe is a low-priced dry dog food with good quality overall. This product has 1 controversial ingredient, but luckily no artificial preservatives, colors and flavors. However, the food has a high amount of carbs, compared to its protein and fat - contrasted by excellent meat and fat quality. Evolve has a below-average number of recalls. Unfortunately, the company was non-responsive when answering our important food quality questions. Deboned Salmon, Chicken Meal, Sweet Potato, Whole Ground Garbanzo Bean, Pea Flour, Chicken Fat (Preserved With Mixed Tocopherols), Pea Starch, Lentils, Ground Flaxseed, Natural Salmon Flavor, Dried Chicory Root, Dried Cranberries, Blueberries, Carrots, Lactobacillus Acidophilus Fermentation Product Dehydrated, Bifidobacterium Animalis Product Dehydrated, Lactobacillus Reuteri Fermentation Product Dehydrated, Potassium Chloride, Minerals (Zinc Sulfate, Copper sulfate, Magnesium Sulfate, Calcium Iodate, Sodium Selenite), Vitamins (Choline Chloride, Vitamin A Supplement, Vitamin D3 Supplement, Vitamin E Supplement, Niacin, D-Calcium Pantothenate, Pyridoxine Hydrochloride (Source Of Vitamin B6), Riboflavin Supplement, Folic Acid, Biotin, Vitamin B12 Supplement). Salmon is generally a healthy dog food ingredient that provides nutrients such as protein, fat and selenium. Salmon also offers one of the highest Omega-3 contents of any type of fish. Raw meat contains about 75% water which is cooked off during the making of dog food. This leaves only a fraction of the protein content in the final product weight. We recommend looking for dog foods that also include meat meals in the first five ingredients (pre-cooked meat powder that contains four times the amount of protein). De-boned simply means that the bones have been removed. Evolve has not included any controversial ingredients in this recipe. This dog food uses named meat and protein sources like deboned salmon, chicken meal. This is fantastic because it shows you the species the ingredient comes from. The same goes for the two fat sources flaxseed and chicken fat - both identify the plant and animal they come from. This Evolve recipe does not contain any controversial preservatives. It’s good to know that ‍not all artificial preservatives are bad. That’s because they serve an important purpose, which is to prevent food from spoiling. However, we consider 11 artificial preservatives controversial because of their potential link to cancer and other serious health conditions. Evolve has a below average number of recalls. The following dry dog food with best by dates of Nov. 1, 2018 – Nov. 8, 2019: 14 lb. and 28 lb. bags of Evolve Puppy Formula (Chicken & Rice), UPC numbers 0-73657-00862-0 and 0-73657-00863-7. Elevated levels of Vitamin D.
Unfortunately, Evolve did not respond to any of our messages.